The national publicity secretary of the Peoples Democratic Party(PDP), Kola Ologbondiyan has said the recent attestation certificate presented to presented Muhammadu Buhari is a fraud. According to the PDP spokesperson, the whole presentation is a comedy full of errors. In a statement by Mr Ologbondiyan on Saturday, a year after Buhari left school, the West African School Certificate (WASC) was still examined in collaboration with the University of Cambridge. He therefore, noted that WASC results were announced in numerals not in alphabets/numerals. Certificates were signed by the vice chancellor of the university and secretary of council. 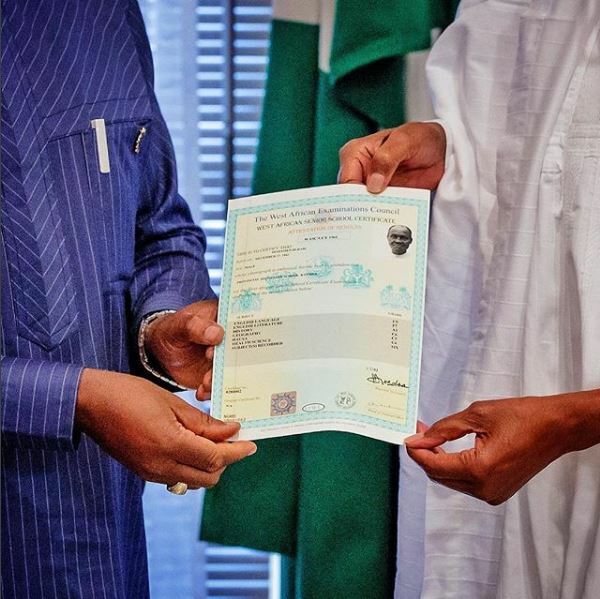 He added that all the certificate from the 60’s which he has seen, are all different from Buhari’s own. The season film Muhammadu Buhari certificate saga has entered Part 2. It is a labyrinth and every scene a comedy of errors. In 1962, a year after Buhari left school, WASC was still examined in collaboration with the University of Cambridge. WASC results were announced in numerals not in alphabets/numerals. Certificates were signed by the vice chancellor of the university and secretary of council.